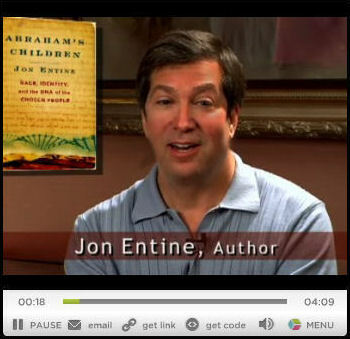 For more background on Jon on his other policy writings, TV productions, and his work as a consultant on sustainability and corporate responsibility, please visit his home page JonEntine.com. Jon gives talks and seminars on genetic genealogy; personal genomics; Jewish identity; the shared biblical ancestry of Jews; Christians and Muslims, DNA and sports, and many other related topics. Find out more. Abraham's Children is a journey back in time and through history to reconnect with our ancestors. View the report on Jewish Life TV on Abraham's Children that went viral on YouTube! Israel in All of Us? Library Journal: "[Jon Entine's] explorations take him from his own Jewish family members' cancer diagnoses to genetic labs—both academic and commercial—across the world, with lengthy forays into Jewish history, the history of Israel and Zionism, and the split between social anthropology and biological anthropology." Nature Genetics reviews Jon’s book in Jon's book, calling it a "broad, well documented sweep of Jewish history that will inform even the most knowledgeable of readers." DNA Consultants writes in its review that Abraham's Children is a "seemingly effortless account of a subject on which blood, sweat and tears have been spilled on every page in the past."